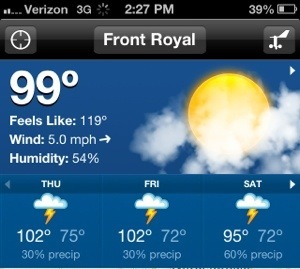 Virginia has definitely been full of weather extremes. We went from record breaking rains and flood advisories directly to record breaking high temperatures and heat advisories. At first it was exciting to finally see the sun again! Such a novelty, but as the heat index rose higher and higher it became apparent that excessively high temperatures, like excessive rain, make hiking a challenge. Trail rumor goes on and on about how nice and easy the terrain in Virginia is, but I’m not sure that I buy it. Sure, there are some nice easy rock-free stretches, but North Carolina, Georgia, and Tennessee all sported some of those as well. 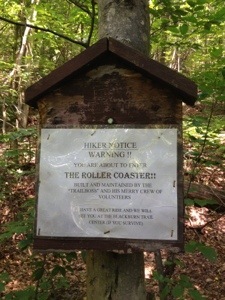 There are also lots of rocky, kind of obnoxious sections of trail, like “the roller coaster”. I got to the roller coaster in the middle of the heat wave. From the elevation profile, it was clear that the roller coaster was named because of the rapid succession of ups and downs. I was hoping that it also meant that it was nice, fast trail… Roller coasters are fun when they are fast, right? Unfortunately, this was not fast trail. It was all incredibly rocky and full of ups and downs. The heat index of 119F might also have colored my opinion of that stretch of trail. My mom had assured me that she was going to bring the sunshine with her when she came to visit me, but I wasn’t quite prepared for this much warmth. She is exceedingly good at everything she does and this was no exception, so I shouldn’t have been surprised. On the upside, mom and dad supplied me (and all of the other thru-hikers they met) with lots of food and cold sodas. They also hiked in the heatwave to celebrate the 1000 mile mark with me. Patches and Patches’ parents… You can see the resemblance in our packs (all lined up at the 1000 mile sign to mark the historic occasion). Sometimes my life on the trail feels a little surreal. Most mornings I start my hike with my head in the clouds… Or at least a dense fog. The fog hangs in the trees and gives the forest a certain fairy tale quality. Fresh fruit is akin to thru-hiker gold. It’s hard to come by on the trail since it’s heavy and bruises easily, so offers of fresh fruit are hard for us to turn down. It was a slightly strange scenario, but I thought about it and I did want a piece of fruit, so I said, “yes”, as I turned and walked back towards the car. The woman in the car rustled through the paper bag beside her, pulled out an apple, and presented it too me with a flourish. “Here, have this apple” she said with a smile. My stride faltered just a smidge and I said, “This feels very Snow White to me.” The women smiled again and assured me that they were hikers, and at the last overlook one of the thru-hikers had told them that fruit was better than candy out here on the trail. 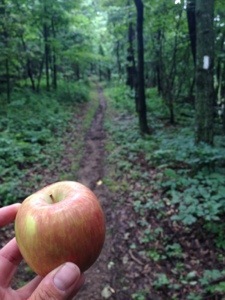 I took the apple, thanked the couple for it and headed back towards the trail. As I re-entered the woods I kept thinking about Snow White. I had been offered (and gratefully accepted) peaches, bananas, oranges and even watermelon from strangers on the trail, but in those cases it just seemed like the weird and awesome trail magic that it was. Being offered an apple somehow came with more cultural baggage than I’d expected. Not just of Snow White, but of Adam and Eve in the Garden of Eden. Those stories both seem to suggest that you shouldn’t take and eat apples offered to you by strangers! Or should you? I looked at my apple again. It was just an apple. I was thinking about this way too much. I took a bite and kept walking. Though it still felt like I was walking through a magically enchanted forest I didn’t fall into a deep, long slumber until after I’d hiked 20 more miles, and I think that slumber was related to exhaustion and not to the very tasty apple. The skies opened up once again and began dumping rain on me at 1-2 inches and hour. I sighed and resigned myself to getting soaking wet again… The same thing had happened yesterday and the day before. Today, however, I only had two miles of hiking left and then I was headed into town to a nice dry hostel. Even though I’d resigned myself to getting wet, the thunder, lightning, and really heavy rain weren’t making it the most enjoyable of experiences. I was hiking at about 2 miles/hr so I figured I only had about an hour of uphill in the rain to go. Suddenly I had an epiphany, if I jogged I could be out of the rain in 30 minutes or less… That would be much better than hiking in the nasty nasty weather for an hour! I tightened the straps of my pack and with water streaming down from the sky and through the trail I started running. It felt good to stretch out my stride and navigate around the rocks and roots. Not long after initiating this plan the slope of the uphill increased and I realized that I’d forgotten something. I’d forgotten that I have asthma. Doh! I stopped running, pulled out my rescue inhaler (which I always keep handy), and almost hungrily inhaled the medicine that would make it so that I could breath comfortably again. However, instead of getting the usual easing of my breath as my chest opens up and my lungs full with air, I felt a caustic burning of my throat and lungs and if anything it felt like my lungs constricted even more. Accidentally grabbed my pepper spray instead? No, it was definitely my inhaler that I held in my hand. Perhaps it had gotten some sort of particulate in/on it that I had just accidentally propelled into my lungs (everything gets dirty when you’re backpacking). I carefully wiped off the mouthpiece inside and out and took a second puff of the inhaler sure that I’d fixed the problem and would soon be breathing easy again. F***!!!! Burning, searing, pain as my lungs really ceased up. I threw my inhaler onto the ground; I threw my backpack onto the ground; I threw myself onto the ground. Stupid inhaler, why was it hurting instead of helping?! For the moment I didn’t care. I closed my eyes, leaned forward onto my knees and focused on breathing… It was starting to work, but I was still coughing and feeling short of breath. I reached over and grabbed my water. It soothed my throat and after a couple of minutes I’d stopped coughing. I was still short of breath, but at least I could think again. What the heck had happened with my inhaler? I remembered the trouble I’d had with my inhaler at the ice hotel in Quebec City over the weekend. It was so cold outside that the inhaler wasn’t working… A common problem with canisters of compressed gases at low temperatures… And suddenly I was thinking about the ideal gas law (PV=nrT), and the compressibility of gases, and thermodynamics. Was my inhaler acting up because of the weather? It was around 90 degrees out, 100% humidity, plus a low pressure system with a severe thunderstorm raining 2 inches/hr on me. I decided that somehow I must be having the opposite problem from Quebec City, that the compressed gas from the inhaler was still rapidly expanding as it hit the tissue of my throat and lungs. Since the expansion of gas is endothermic, that could essentially burn my throat and lungs with intense cold. I had a hypothesis… Could I test it? Hmmm… I reached over and picked up my inhaler, which was still sitting in the middle of the trail where I’d thrown it in frustration and anger, and looked at it for a minute. My hypothesis was that the weather conditions were causing the compressed gas in the inhaler to expand over a larger area than usually, so that a noticeable endothermic reaction was still occurring as that compressed air hit my lungs. Based on that hypothesis I would predict noticeable plume as the inhaler was puffed into the open air around me instead of into my lungs. I pointed the inhaler away from me and delivered a puff over the trail. It looked liked the white plume of breath that you see when someone exhales moist air on a cold winters day… Except that it actually had a propellant, so the plume extended out for about 3 feet. I was still short of breath, so now I needed a plan. How to get the drugs from my inhaler into my lungs without giving them frostbite? I decided to use my hand as a spacer tube, hoping it would allow the gases to expand in my hand and not my lungs, while still directing the medication into my lungs. With some trepidation, I squeezed down on the inhaler and inhaled (rather cautiously this time). It worked!!! No horrible burning sensation, and my lungs started to open up. I took a second puff the same way, and my breathing returned to normal. Now I *really* was drenched. The rain kept pouring down as I walked the rest of the way to the road. I made it in 45 minutes. Extra credit assignment: Demonstrate mathematically the crucial parameter/s (was it the humidity? the thunderstorm? or a combination of the humidity, thunderstorm, and temperature?) that led to the inhaler doing more harm than good. If I were at home I would have modeled this already and figured out the critical parameters both for this story and for the ice hotel… I miss having pencil, paper, and the easy ability to look things up and research them! I arrived at a rather decrepit shelter in the middle of a yet another thunderstorm and plunked myself down. It was the end of a long, wet day of hiking so I was very glad to finally be somewhere dry. All of the shelters are not created equal, but as long as it was dry I figured it was good enough for me for one night. Unfortunately within minutes of sitting down dozens of bees started buzzing around me. I sighed and periodically brushed away the bees that deigned to land on me. They didn’t seem interested in stinging me, but were definitely annoying. A few minutes later my friend Chuckwagon arrived, and half of the bees devoted their attention to him. He swatted at them and grumbled. I wondered aloud if the Deet in my bag would deter the bees, but Chuckwagon suggested that smoke was what we really needed. Everything was sopping wet, so we didn’t feel like fighting to try to get a campfire started. Instead, we decided to wait for Colonel Patches to show up so that we could encourage him to smoke one of his cigars and rid us of our bee problem. A few minutes later Co. Patches arrived and with some encouragement lit his cigar. Unfortunately, the bees did not peacefully disperse as we had hoped, they just found a third target to harass. Whereas Chuckwagon and I had been sort of idly swatting at the bees, Co. Patches was out for the kill. Armed with his cigar and a map he started targeting the bees and picking them off one by one. He’d take a puff of his cigar, idly blow it at a bee and then swat it out of the air with the map. One bee down… Two bees down… Three bees down. 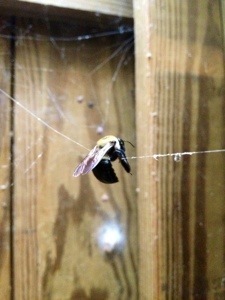 Suddenly it seemed like a live action bee killing video game… “The Bee Zone”. 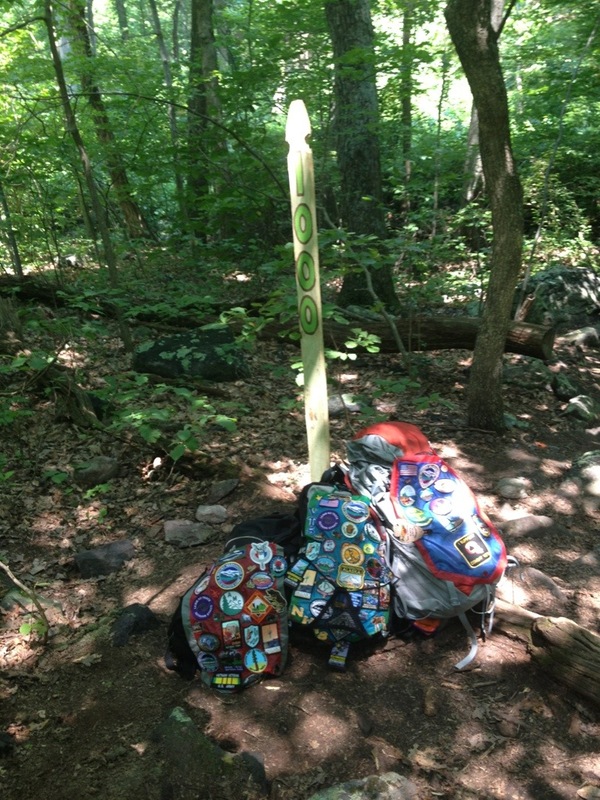 For some reason the bees were really attracted to the grips on my hiking poles… There were about a dozen of them peacefully congregating there at any given time, so we declared the poles to be the evil villains home base. The bees clearly always regrouped there between their flights of targeted annoyance and irritation. We decided that he couldn’t kill any of the bees while they were actually at their home base. 4 bees down… Five bees down… Six bees down. Co. Patches had finished the first easy level of killing the bees, which was conducted while sitting on the floor of the shelter, but there were at least a dozen bees still flitting about. It was time to proceed to the next level of the game, which involved him standing up and actively chasing the bees. Seven bees… Eight bees… Nine bees down. We envisioned the running tally of bees killed and bees remaining in the upper corner of the video game screen. 10 bees… 11 bees… 12 bees… Co. Patches was really getting into the swing of it now. 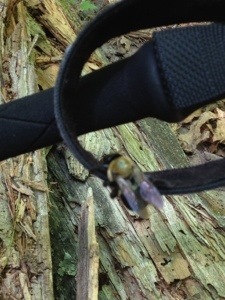 There were only four bees left on base (the hiking poles). One took flight and Co. patches chased it down and killed it…13 bees… Then another… 14 bees… Then another… 15 bees. With only one bee left on base I jiggled the pole and it flew out into the danger zone. Co. Patches chased it into the rain (almost gleefully) and before long he called out, “16, hah! Got them all”. He returned to the shelter and sat down to bask in the glory of a mission accomplished. The shelter was definitely a more comfortable place without all of those pesky bees flying around. Suddenly another bee appeared… Chuckwagon and I laughed as Co. Patches chased in down… “17 bees… Or is that 18?” Without the tally running at the top of the screen we were started to lose count. (Bonus points to anyone that puts together the phone app for level one, “the bee zone” of the thru-hiker video game and sends it to me). At least the rain isn’t lasting all day, everyday now, though I still seem to be getting caught by intermittent deluges where the sky opens up and dumps 1-2 inches of rain in an hour, and then sunnier skies return. It’s definitely an improvement over the last week, so I appreciate that. Yesterday, for the first time, I found a tick on my leg. It didn’t seem to care that I’d coated myself in deet, or maybe the rain and sweat had just rinsed all of the insecticide away. Ticks and Lyme Disease are constantly on people’s minds out here. I check myself for ticks everyday, and have been glad not to find them. Some of the other hikers have found as many as 29 ticks on themselves in one day! The hikers with dogs seem especially prone to collecting lots of ticks. Hopefully that will be the first and last tick to try to feast on me, but I will remain ever vigilant in my battle against the bugs. It looks like I might actually get a break in the weather so I’m going to get back out on the trail and soak up some sun while it lasts!